While Nelson Mandela was still imprisoned on Robben Island, South Africa, Hugh Masekela wrote “Bring Back Nelson Mandela,” which not only became a big hit for Hugh, the song became an anthem and eventually was the accompanying music for Nelson Mandela’s world tour after Mr Mandela was released. 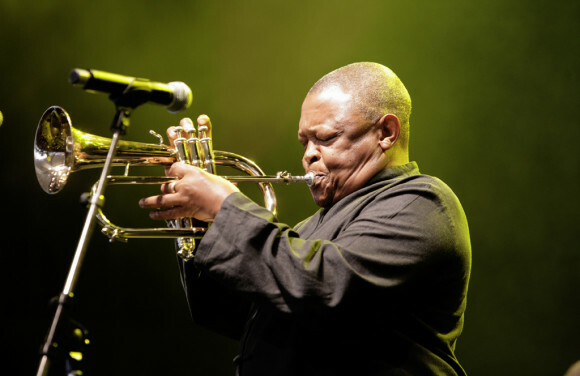 There is a lot of music to consider as the great man of African music celebrates his 70th birthday this weekend, but on this occasion I want to focus on Mr Masekela's recent music. First, we consider music from the 1997 album Time. Opening with the determined pledge and declaration “Send Me,” it is obvious that while Mr. Masekela might have attained senior citizen status, age-wise, he has no intentions of retiring from the struggle. “Change” is a political statement calling for leaders who have overstayed their welcome to vacate the premises. “Mamoshaba” is a theme reminiscent of the jazz from the album we highlighted recently, Home Is Where The Music Is. “Conchita” is a homage to his Nuyorican and Latin neighbors who were among Mr Masekela’s closest friends while he was in exile in <?xml:namespace prefix = st1 ns = "urn:schemas-microsoft-com:office:smarttags" />New York. Finally, “Old People, Old Folks” is a respectful albeit humorous bow to his elders reflecting on the off-stated theme that dancing keeps you young. What is particularly noteworthy is that rather than simply recycle past hits or simply try to ape the latest radio hits, Hugh Masekela has put together an album that forwards Hugh’s views and values on both a musical and a social level. There is a time and place for everything. Hugh Masekela remains timely precisely by being real, by reflecting his own reality, by speaking to the issues of the day, and by using the tool of his music, a potent tool which he continues to wield with power. “Stimela (Coaltrain)” is a perennial favorite first recorded in 1974 on the album I Am Not Afraid. Not only is Mr Masekela not tired of playing the song, he continues to develop the selection. I have at least five or six versions but the best one is this quarter-hour workout from Live At The Market Theatre recorded June 2006 in Johannesburg, South Africa. Hugh Masekela’s spoken introduction is absolutely superb in contextualizing the song’s meaning, in simultaneously expanding the meaning to include economically exploited workers worldwide, while specifying the migrant mine workers in South Africa. His singing is both impassioned and expert in evoking the physicality of the coal train—when you hear it, you will know what I mean. Even if the band wasn’t happening, Hugh’s extended spoken word would make the song a definite keeper, but the band is banging, big time. They do more than provide backup—every step of the way they are solid in the pocket and when offered solos, they step forward with verve, keeping the musical train rolling with surging, energetic contributions. The personnel is Hugh Masekela (flugelhorn, vocals, cow bell); Khaya Mahlangu (tenor sax, flute, background vocals); John Selolwane (guitar, background vocals); Arthur Tshabalala, Ezbie Moilwa (keys, background vocals); Fana Zulu (bass); Sello Montwedi (drums); Francis Fuster (percussion, background vocals). I am particularly enamored with Selolwane’s guitar work which combines both the distinctive South African voicings and the jazz style of George Benson using his voice to parallel the musical notes. I have heard Mr Masekela do this song in concert. He never fails to deliver but this is a monumental version worthy of the designation—classic! This third part is a totally unexpected pleasure. When Mr Masekela landed in New York he wanted to be a jazz trumpeter, dreamed of joining Art Blakey’s Jazz Messengers. Fortunately for the world of black music, that didn’t happen. Instead of aping African American musicians, he ended up significantly enlarging the music with his South Africa accents and roots. But, you know, some dreams die hard. While Hugh was in music school in New York he became very close with two fellow students; one was pianist Larry Willis and the other was Steward Levine, a then-saxophonist who over the years became a music producer and partner with Hugh. Back in the late 1960s, they had spoken often about producing a jazz record. Nearly 40 years later, the seed planted long ago blossomed into an incredibly beautiful album of jazz standards. Almost Like Being In Jazz, recorded in October 2004 in Los Angeles, features Hugh Masekela – flughelhorn, Larry Willis – piano, John Heard – bass, and Lorca Heart - drums. The music is both as smooth and as potent as a sniffer of an 100 year-old French cognac. This record is a quiet conversation. Willis plays piano like he has secrets he wants to tell but rather than rush to get it all out at once, he takes his time revealing the tales letting the improvisations grow organically and gently flower. But as wonderfully sensitive as Willis is, this is still Hugh’s session. The title comes form statements made by critics long ago that Hugh Masekela couldn’t really play jazz. This, is his sly vindication. There are at least a hundred jazz trumpeters who wish they could do what Hugh does here. There is never any doubt it’s Masekela: the sound is his, and his alone. What is strikingly personal beyond the sound is the tiny embellishments that grace nearly every phrase. He gathers up notes like a bouquet of orchids—stunning, multicolored. It’s all in the way he changes pitch while holding a note. A microtone of lip movement here, a slight gliss at the end of this one, a bit of vibrato to make a second note shimmer, he adds extra air to a third one. And it’s all done with taste and finesse. This is the kind of subtle blowing that old masters use to teach lessons to young lions. Listen to these four selections (“It Never Entered My Mind,” “Midnight Sun,” “Presente De Natal” and “You Don’t Know What Love Is”) and know what tenderness is. None of his other recordings come close to this—but isn’t that the way life is, or ought to be? Shouldn’t we improve with age? Shouldn’t experiential wisdom deepen our abilities to reflect on the beauty and joy of living? By age 60, most trumpeters chops are shot but with this album, Hugh Ramopolo Masekela, born April 4, 1939 in Witbank, South Africa, instead of fading into instrumental obscurity, significantly ups the ante of artistic musicking. With a wink and a smile to a jazz tradition no one expected him to so expertly employ, master Masekela adds a resplendent jewel to his crown of musical achievements.